Solid State Drives (SSDs) offer responsiveness and throughputs unmatched by rotating media, but the persistent challenge has remained bringing the costs down far enough to spur greater adoption. 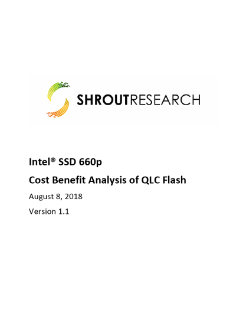 SSDs came into the mainstream over a decade ago, and since then we have witnessed gradual increases in density in the form of process shrinks, a shift to multilayer 3D cell structures, and by increasing ...the number of bits stored per flash memory cell. With those advances come greater capacity products at reduced cost. While this progression is typically slow going, every once in a while a company comes along and shakes things up with a step change in either performance, capacity, or cost. The Intel® SSD 660p aims to take a shot at the latter while maintaining class-leading performance.